Thank you SO much for posting all of this. Very helpful! I love all the tips. I usually have to go through all the trial and error myself! I have been looking for a good recipe. Appreciate it! Yes, I have been looking for a good recipe like this! The only thing is that I don't currently have an oven...hmmm...I might get daring and try the toaster oven with the silicone cups...whatcha think? Oooh, I don't know, Renee. A few days ago I was cooking for P&T and put silicone cups in my toaster oven and it messed them up! They now have weird stain-looking streaks all over them, that won't wash away, like they burned. They are still functional but are so ugly now! Do you have a tray for the toaster oven? Or you could try wrapping a rack in foil...and then use the granola and ball it up into bite sized pieces and do it that way in the toaster oven. ??? Love this! I will definitely be making these! I love that they don't have PB in them, because they are safe for my daughter's peanut free classroom. Yay! These are going right on my TO MAKE list! Thanks! Thanks! hey, one thing - the RECIPE tag does not show up in your Tag Cloud, probably because you've just started recipes. Please add it for your fans?! Ok, so get this - a bunch of us got together and inspired by your pick post, ordered a crazy pile of stuff from a crazy bento ebay vendor. Super cute, but boy, are they SMALL! Do you really use them for your older son? The animal picks are so so tiny! I hope you had fun picking out a bunch of bento goodies! :) The picks ARE small, so they fit in the small bento boxes! My older son really does use them (I do too, sometimes!). Because they are so small I'm a little nervous about my younger daughter using them, though the more she uses them the better she is about using them appropriately (like, not sticking the entire thing in her mouth!). 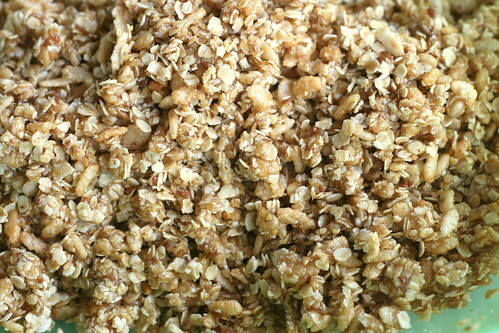 Ok, I have to post because we're allergic to peanuts (and other nuts) and coconut (and dairy and oats, and a few other things actually) and if I can find a whole grain besides oats to do this with, I am definitely going to because I am so excited to even see a recipe that is SO CLOSE to being something we can eat! Thank you!!! I wonder if I made it with rice cereal if it would come out looking more like rice crispie treats....I'm going to have to try that, thanks Melissa! I am in a similar position as Jenny - gluten free so no oats. I know there are GF oats but tring them with all rice cereal is a great idea - sort of like the Cocoa Rice Bars but even more delicious because they are home made :) Thanks! This looks great! I will definitely be making these soon. Keep up the good work- I LOVE your blog! Could these be made in a regular muffin tin? Thanks for adding the recipe! I love these! I made a batch last week and my kids were very happy. I currently have a batch in the oven and I used Coconut oil instead of the canola and I hope they turn out. They will probably have a nice coconut flavor to them. Yummy! I have mine in the oven as we speak. I can NOT wait to try them. I sampled some of the "batter" and it was soooooo good. i just made yet another batch of these, and yum. i added about 1/4 cup of sun butter to them for an extra nutritional kick and it was delish! Yum! I can't wait to make these later in the week!! Any feedback on making them in mini muffin pan? Kathryn, I haven't tried that. I'd be worried they might stick and not come out. If you try it you might want to not let them bake as long because they might brown more quickly from contact in the pan. 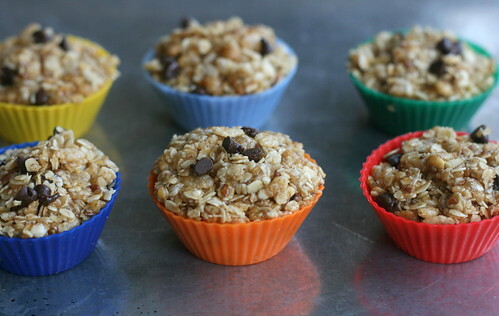 I made these yesterday in a mini muffin pan and they came out fine. I sprayed liberally with cooking spray and pressed the granola mix into the muffin holes with the back of a spoon. After cooling awhile, they popped out easily with the help of a butter knife. They are not as pretty without the colorful silicone cups, but they sure taste good! I used coconut oil, coconut flakes and some chocolate chips. Yummy. Thank you so much for the lunch inspiration and for posting this recipe! You are my savior! My daughter is allergic to eggs, milk, soy and nuts and there are NO granola bars on the market. Instead of regular chocolate chips, I will sub Enjoy Life chocolate chips which are allergy free. I make homemade granola, but have yet to find one that does not crumble. Thank you so much for this recipe - we made them this weekend and the whole family loves them! They are a treat for my kids, who are allergic to milk & nuts and can't do commercially prepared granola. How long do you find that they last in an airtight container? Have you ever tried to freeze them? Jill, they last for a long time! 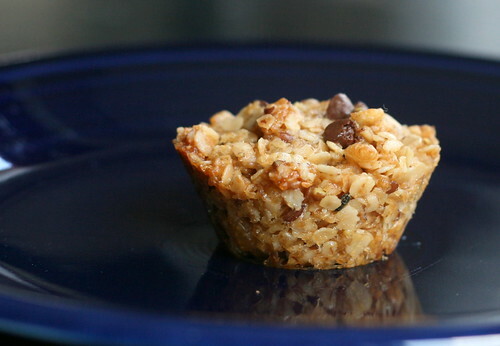 I had a few granola bites in a canister get buried in my pantry for over a month and they were still perfect. This was during summer, and I live in a humid environment - I was surprised they were still good, but they were! :) I haven't tried freezing them, but I'm positive they'd freeze just fine! Quick question: are these more on the chewey side, or are they the "crunchy" type? Quick question, I have made the granola bars three times so far and OVERALL love them. However, they seem to keep falling apart on me and the chocolate is like half melted. I wait the entire night to cut into them (even though I have been so tempted). So my question is - am I making them too wet before baking or baking too long which is melting the choc?? Going to try the mini bites next and I do not want to screw it up. Granted, we eat it all but I can not keep it together for a lunch box. Please help with any suggestions because this is so close to being a staple in our home. I'm so glad I found this recipe! I've been trying to find a good granola "bite" recipe that doesn't contain any peanut butter or coconut (just good ol' fashioned oats and honey for me, thank you very much!) and I appreciate your section on how to adjust our baking times to accomodate for the teeny-weenie size too! azbaby24 - that's a tricky question. I don't think you are over-baking them because if that was the case they'd be coming out over-browened and very hard/crunchy. I accidently over-baked a batch this week and -yuck- I choked down a couple and had to throw the rest away. Way to dry and cruchy with a burnt aftertaste (so disappointing!). I'm wondering if the temp on your oven is where it should be - and if you are actually not baking them at a high enough temp - that could cause them to crumble. Do you have a thermometer to check? I swear though that the weather has a lot to do with it! I have a very hard time having these turn out well when it is hot and/or humid. I have much better turn-out when our weather is mild. I know that sounds sorta crazy! I DO think you'll have an easier time with the smaller bites - those hold together much better! Thanks for this recipe! I substituted chopped Craisins for the chocolate chips (and decreased the brown sugar) and baked them in a mini muffin tin. They were a hit at preschool snack time! 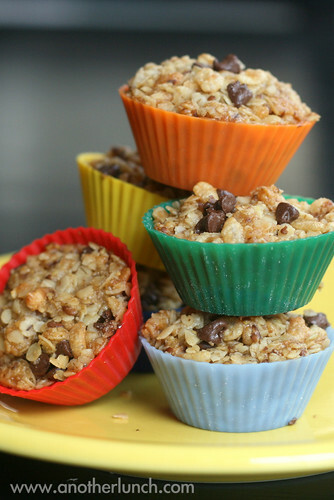 I just made these with my kidlettes (and gave you some link love). They were a bit - well, a lot - too sweet for us, but it was a great starting recipe for our whole food family. I also used heart shaped silicon cups in honor of Valentine's Day. They needed about 14 minutes in the oven, and worked great! Thanks! Thanks for posting this recipe! I tried them yesterday and they are very yummy! 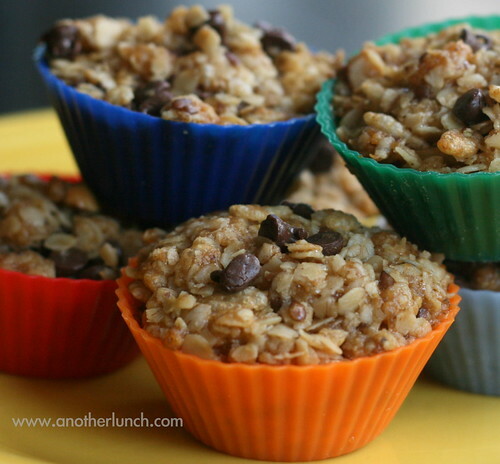 I made these this weekend for our breakfasts on the run and I wrote about them on my blog I hope it is ok that I linked to you and your post. 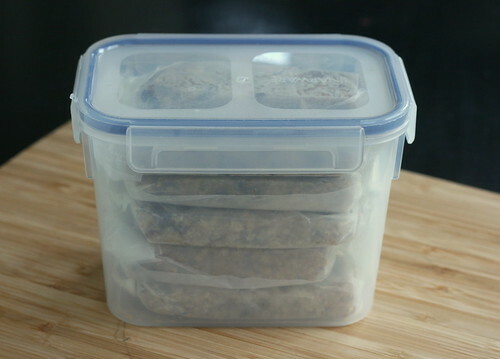 I had to adapt the recipe a little to fit my cupboard :) The post isn't going up until later this week because I really can only write during the weekend so I space out my posts if I write a few on the weekend. Anyway, thanks for the recipe! So glad you are back! I made these today with my daughter and they were so easy. Best of all delicious! We made bars and put cute stickers on to seal them - that is such a great idea. I added 1/4 of cup of peanut butter and 3 TBS of flax and they were great. I used GF Oats from Bob's Red Mill and they seem to be holding up just fine - not crumbly. Next time, I may add an egg to up the protein factor and cut back on the oil. I'll let you know if it works! 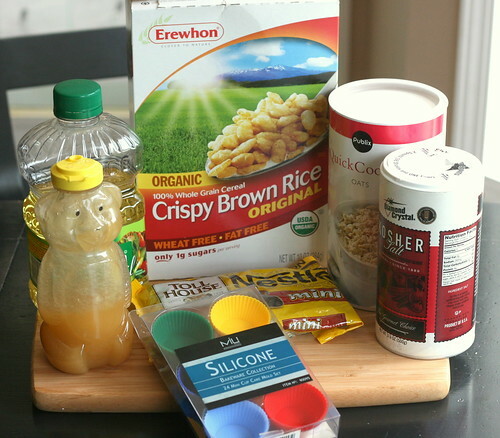 I tried this and used gluten free rice krispies, supplemented oat bran for the wheat germ and added sun flower seeds, sesame seeds, and minced Blue Diamond roasted/salted almonds. I also use maple syrup instead of the honey. LOVE THEM! I've made this bars three times now, and the have come out really greasy, to the point that the chips don't even go back to "solid" after cooling off. Any ideas what might be going on? I make sure I measure the ingredients right, so maybe reducing the amount of oil in half perharps? Made these last night for my triplets' class snacks. They came out great! I'm going to do the bites next time to put in their lunchboxes. What would be the best way to leave the granola to set overnight? 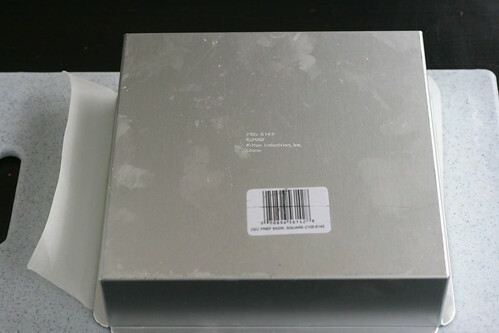 Do I need to cover with the baking pan with wrap? Thanks! After looking at these for a couple months now, I decided to make a batch. They are FANTASTIC. I used 3 Tbsp toasted wheat germ in mine too and followed the rest of the recipe exactly. They are delicious and I must admit I didn't let them sit overnight but had no issues.. I did let them sit for 5-6 hours though. I think I cooked them a touch too long because the edges were crunchy.. the rest was chewy and delicious. The hubby likes crunchy granola, so I just got all the edges for him! What a fantastic recipe. I'm going to try them with peanut butter chips next time since I like PB too. I have to say also that my daughter, who is weird about textures and refuses oatmeal DEVOURED the mixture before it was cooked. So I'll be keeping a bit out each time I make them for her just to eat before baking! YUM! I just made these and they taste great. 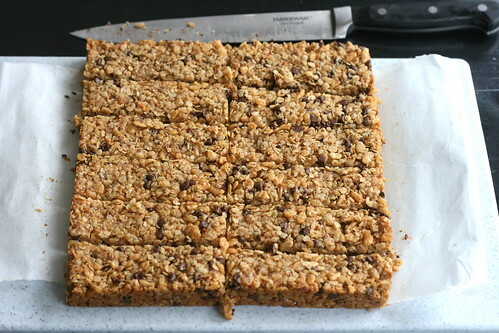 I used the regular oats instead of instant, and they were crumbly as was mentioned, but it was kinda fun to eat a chocolately, crumbled oat and rice krispie mix. It was like eating warm oatmeal chocolate chip cookie dough. I don't think I got the exact mixture right, as it sort of had a pool of oil on the bottom (nope, I didn't wait to eat it either). 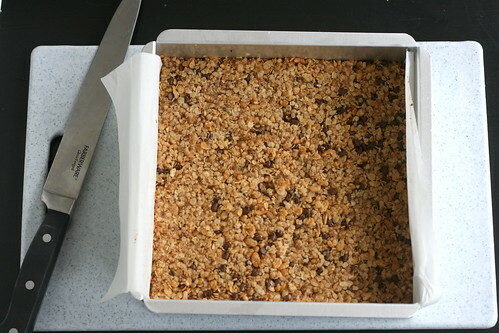 For making it as a crumble, I think next time I will use less oil and more oats/krispies, not spray the bottom with cooking spray, and cook it a little longer to make it crunchier. This is a great recipe though. Thanks for publishing it! And it's fairly easy to modify or customize for whatever you want. My daughter, who is the baker in the family, made these today. She likes granola bars but was annoyed at the amount of ingredients in them. We didn't have vanilla but happened to have almond extract. They came out better than i could have imagined! She wrapped them all up for her lunches this week! Thanks for sharing! When you make the mini muffin tin ones, do you cool them in the pan? I just made these and they were fantastic! I did want to comment about the small changes that I made..1st I also used old fashioned oats that I pureed. 2nd I sustituted agave nectar for the honey (super healthy) as well as I used apple sauce in replace of the oil to decrease both calories and make it healthier. I was unsure how this would affect it, but they turned out amazing without any crumbling at all (using the mini muffin method). I also halved the chocolate chips and added craisins. Thanks a ton for the recipe, my children loved them and will never buy granola bars again!! 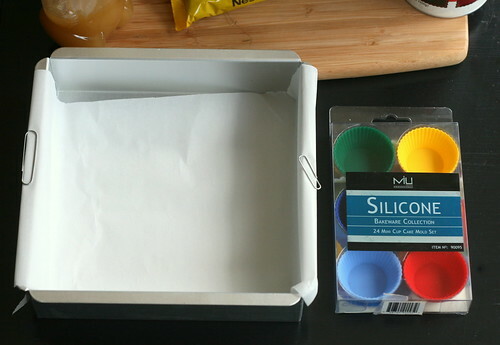 Hilo80 - when I make them as mini muffins I use silicone cups. I'm not sure how difficult they'd be to get out of an actual pan. I think I'd be inclined to let them cool a bit, but try to pop them out before setting too much. 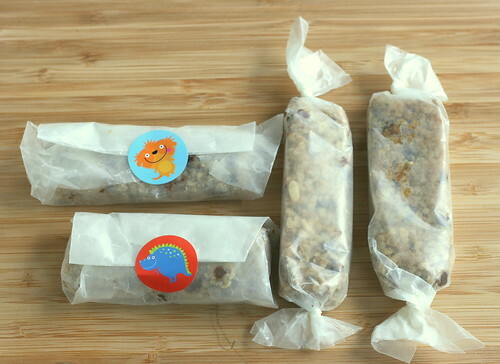 I made these today for my allergic child and he was SO excited to have granola bars. Yummy!!!! I used mini muffin pans. I cooled in the pan, then gave each one a little twist and they came out with no problem (I dud lightly grease the pan). I used half ground oats and half oats. The texture was perfect. I did have to add extra oats because the mixture seemed really wet and greasy. Amazing recipe!!!! I'll try to make this specialty tonight!Thank you for this wonderful recipe!!! I've made these twice now--the first time I followed your recipe, but upon entering the measurements of the ingredients into a calorie-counting website, I was super-shocked at how calorific they were. So Round 2 was done with some modifications: omitted brown sugar, swapped oil/ honey measurements (1/4c oil, 1/2c honey), upped rice cereal by 1/2c, reduced oats by 1/2c (just because I prefer them crunchier). I've also stored them in the fridge. I made these with my class yesterday. It's a great recipe for kids to help! I baked them on a cookie sheet, and they turned out great! They are crispy and yummy!